Beautiful girl in Santa Claus hat in is sitting on sofa her living room and smiling to the camera. Home is decorated for christmas time. Smiling young woman in santa claus chating with friend on laptop and drinking coffee on the christmas tree background in the living room. 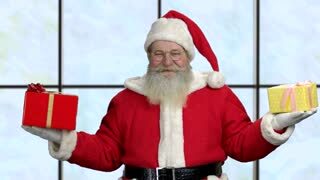 Close up shot of santa claus in the red hat holding the gift box and smiling to the camera. while sitting on the red chair in the room with christmas tree. Dolly shot. Cute little kids joying the gifts getting from Santa Claus, kids snanding near Santa and sitting on his knee on the christmas tree background. Attractive african man in red santa claus costume and hat holding the gift and smiling while sitting in the big red chair near christmas tree. Dolly shot. Old smiling Santa showing thumb up. 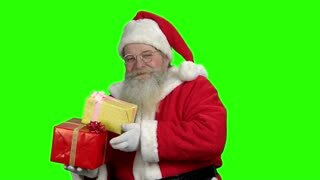 Cheerful Santa Claus holding gift boxes on green screen background. Special Christmas offer. Smiling Santa Claus with New Year gifts. Portrait of Happy authentic Santa Claus with gift boxes indoor, front view. Special Christmas offer.